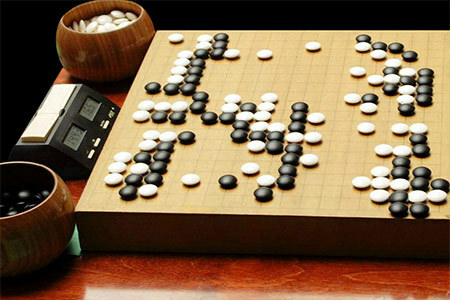 The mystery deepens about the source of the quote about “if intelligent life forms exist elsewhere in the universe, they almost certainly play go” (“Who Really Said Famous Go Quote? 11/21 EJ). Thomas Rohde in Germany thought that he’d tracked the quote to Emanuel Lasker’s 1930 book “Brettspiele der Völker: Rätsel- und Mathematische Spiele” (“Board Games of the Peoples – Riddles and Mathematical Games”), but had to order a copy of the book to confirm it. Meanwhile Erwin Gerstorfer, who has “Brettspiele der Voelker” in his collection “checked the complete chapter about Go (as well as the introduction chapter) and if I did not overlook something, then there is unfortunately no reference to the quote that we are interested in.” When Rohde’s copy arrived he confirmed that the quote isn’t there but in an online history of European go he found a reference to Emanuel Lasker that reads “In another publication he says: When there are other intelligent beings in the universe, than they maybe know chess, but surely Go.” “I wonder which ‘other publication’ this may be,” says Rohde. The American Go Association’s rank certification program took another step forward when the AGA’s Board of Directors approved proposals laying the groundwork for a general rank certification program based on playing results at its November 23 meeting. Work is ongoing to review analytical models to support the program. The AGA’s president was directed to develop a policy such that a ranking could affect a player’s AGA rating. The president will soon appoint a Rank Certification Coordinator to facilitate the program. Volunteers will be sought to create and send out a large number of certificates. In other updates, volunteers will be sought to work on updating the AGA Tournament Guide, and the board appointed Peter Schumer to be the new AGA secretary. Click here for the complete minutes that have been approved by the board. Registration is now open for the 2016 International Paris Go tournament, which will be held March 26-28 in Neuilly, in the city’s western suburbs. This is the 44th edition of the event, a 6-round tournament; prize for the winner is 1000€; click here to register. Lee Sedol 9p to face Ke Jie 9p in the final of the 2nd MLily Cup. The semifinals of the 2nd MLily Cup were played on November 22 to 25, 2015, in Hefei, China. Lee Sedol 9p was faced to Ahn Seongjun 6p, and Ke Jie 9p was played against Park Younghun 9p. Park Younghun 9 dan (left) and Ke Jie 9 dan at the semifinals from the 2nd MLily Cup. Ke Jie and Park Younghun’s semifinals was one of the most interesting matches in 2015. Ke Jie is ranked #1 in China, and he proceeded to the final of the 2015 Samsung Cup in early November by defeating Lee Sedol. He is officially undefeated as White in 2015, and that’s really unbelievable. Ke lost to Kang Dongyun at the semifinals of the LG Cup about a week ago, and that was his first defeat in international tournaments in this year. He defeated Wang Zejin 3p and Rong Yi 4p respectively to proceed to the semifinals. Meanwhile, Park Younghun is in his second heyday in 2015. He’s ranked #3 in Korea, and he proceeded to the final of 20th LG Cup by defeating Tuo Jiaxi 9p about only a week ago. In this Mlily Cup, he defeated Chang Hao 9p and Zhou Ruiyang 9p before this semifinals. In game 1, Ke Jie took White and he played smoothly and thickly. The game was peaceful and territorial, which was Park’s pace, but Ke’s thickness built a huge territory in the center at the end. In game 2, Park played smoothly in the opening, and he didn’t avoid fighting after Ke made an overplay at the bottom. Park managed the game neatly, and Ke didn’t gain any chances afterwards. In game 3, the game started with a peaceful opening again, which is Park’s favorite. However, Ke’s reduction in the center was exquisite and his endgame was excellent again. There was nowhere for Park to show his special technique in the endgame. Ahn Seongjun 6 dan (left) and Lee Sedol 9 dan at the semifinals from the 2nd MLily Cup. Lee defeated Ding Hao 2p and Tang Weixing 9p to the semifinals, and Ahn won against Tuo Jiaxi 9p and Xie Ke 1p to face Lee. Lee Sedol has been in bad form lately. He lost to Ke Jie at the semifinals of the 2015 Samsung Cup by 2-0 in early November, and he’s lost several domestic games too. However, Lee was still too superior for Ahn Seongjun to overcome, and Lee won the series pretty easily with a 2-0 score. Lee showed his power and strength in two games, and his moves were strong and sharp as he did when he was unbeatable. Lee Sedol 9 dan at the 2nd MLily Cup. The final of the 2nd Mlily Cup will be started from December 30, 2015. Lee and Ke have only played two games so far (at the semifinals of the 2015 Samsung Cup), and Ke won both. At an interview after the MLily Gu vs Lee Jubango in 2014, Lee said “I’ll try my best to win another international title in 2015”, and this final will be a great chance for him to do so. He won the Asian TV Cup in 2014 and 2015, and he’s still very powerful and destructive when he is in good form. Ke Jie 9 dan at the 2nd MLily Cup. Ke Jie won the 2nd Bailing Cup at the beginning of this year, and he is in the final of 2015 Samsung Cup and this MLily Cup. If he wins one of these or both, he will soon become the most powerful player in the world after Lee Sedol and Gu Li. Let’s look forward to the final between Lee Sedol and Ke jie! The MLily Cup is a biennial international Go tournament, which started in 2013 and is sponsored by MLily Meng Baihe – a mattress and bedding company. It’s intended that it will alternate with the (also biennial) Bailing Cup, every other year. The draw consists of 16 seeded players from China, Korea, Japan and Taiwan and 48 players from preliminary rounds, including 4 women and 4 amateurs. Each player receives 2 hours thinking time and 5 x 1 minute byo-yomi. The main time is increased to 3 hours each for the final. The semifinals are played as best of three matches and the final is a best of five match. The winner receives 1.8 million RMB (about $290,000 USD at the time of writing) and the runner up receives 600,000 RMB. This puts the tournament in the same league as the Bailing Cup and Samsung Cup, in terms of prize money. The official name, ‘MLily Meng Baihe Cup World Go Open Tournament’ (try saying that 10 times) uses the sponsor’s double barrel English and Chinese names. The Chinese name, 梦百合 Meng (=dream) Baihe (=lilies), translates literally to ‘dream of lilies’. A looser, but more natural translation would be something like ‘sweet dreams’. This explains the somewhat cryptic ‘MLily’ moniker. Black 15 was interesting, but Black 27 would have been better at M17. White 30 was big, and the game up to White 42 was smooth for White. White 46 to 56 was a sophisticated sequence to make his group stronger. White 70 was bold, and Black 81 wasn’t big enough for a ko threat. Black should have played C7, White 82, B6, D6, B4. White consolidated his lead up to 94, and his sequence from 112 to 122 was exquisite. When White built a huge territory in the center, the game was decided. Black 39 was slack, and White took the early lead with a sharp combination at 42 to 44. White 68 was big, and 72 to 76 was a good decision to develop the upper side. Black tried to reduce White’s top, but White’s responses from 80 to 96 was accurate. Black started to attack from 99, but White’s sacrifice strategy was excellent up to Black 117, and White maintained his lead with 118. Black 149 was a brilliant tesuji, but it was too hard to change the flow of the game. White 160 was correct, and the game was over up to White 166. Black 17 was an interesting probe, and the opening up to White 22 was even. White 30 was a well timed invasion, and the result up to White 44 was still playable for both. White 50 and 52 were Park’s style of play, and Black 53 wasn’t as good as it looks. Black 57 was an overplay, and White 58 to 60 formed a strong counter. Black started to attack White’s left side group, but White’s sabaki up to 76 was flawless. White 88 and 96 were strong, and White took the solid lead up to 102. White 108 and 110 were a safe way, and there was nowhere for Black to catch up afterwards. Black 23 was sharp, and Black took the control of the game through to 35. Black 41 and 47 were vital points to attack White, and White was in trouble up to Black 57. White won the ko in top right corner with 72, but Black was satisfied with 73. Black 87 and 93 were accurate responses, and White didn’t gain anything up to Black 111. Black 117 was strong attack, and 123 was the vital point. The game was practically finished with 135. The opening up to White 26 was well balanced. Black 43 showed a good sense, and White 44 was to take sente. White 46 was thick, but slow. Invading at N17 would have been better. Black 51 was a nice attachment, and Black 55 to 57 were brilliant followups. White 58 was well timed probe, but the game became favorable for Black up to 81. Black 87 to 93 were bold and subtle, and Black was still ahead up to 103. Black 107 and 117 were sharp, and it wasn’t easy for Park to catch up in the endgame. Ke Jie’s endgame was excellent, so that Park Younghun couldn’t catch up.